Marzell Black testifies during Searcy evidentiary hearing March 26, 2018 to corroborate Smothers’ confession to Segars murder. 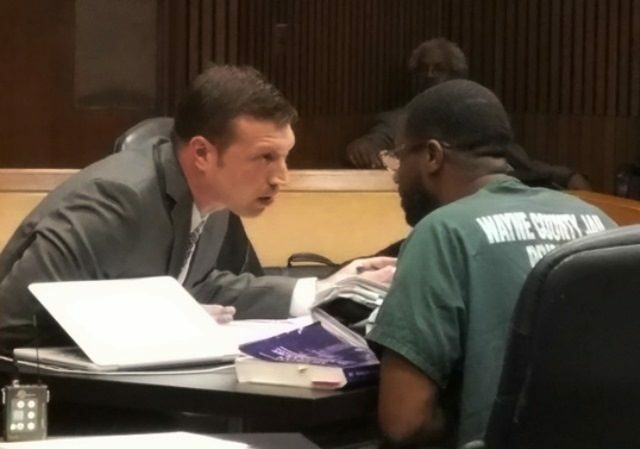 DETROIT—Marzell DShawn Black, 30, took the stand March 26 during an evidentiary hearing in the case of Thelonious Searcy, in front of Searcy’s trial Judge Timothy Kenny. 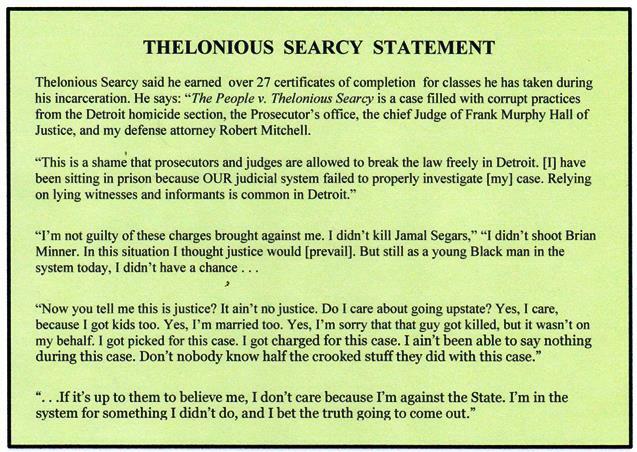 Black corroborated earlier dramatic testimony March 19 from former Detroit hit man Vincent Smothers that Smothers, not Searcy, killed Jamal Segars Sept. 5, 2004. Smothers’ testimony had been challenged by the prosecution as coerced by Searcy family members and associates. Most of the packed courtroom was filled with Searcy supporters, while a small group of hostile family members and associates of Jamal Segars was also present. Black is serving a 15-40 year sentence for “Homicide-Solicitation of Murder.” He confessed earlier that he recruited Smothers to kill Rose Cobb at the request of her husband, Detroit police officer David Cobb, in 2007. Cobb allegedly hanged himself later. 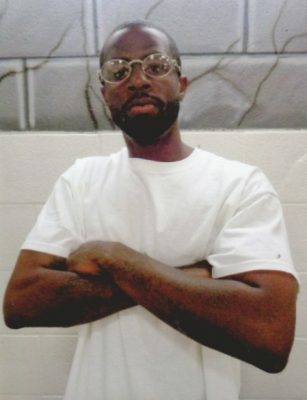 Thelonious Searcy, in fight for his life. He said while they were in prison after their joint trial in the Cobb killing, Smothers mentioned to him “a couple of guys” that were serving time for murders Smothers committed, that Smothers wanted to exonerate. The two were Davontae Sanford, arrested at the age of 14 for four killings in 2007, and Thelonious Searcy, known as “Skinnyman,” arrested in 2005 for the Segars killing. 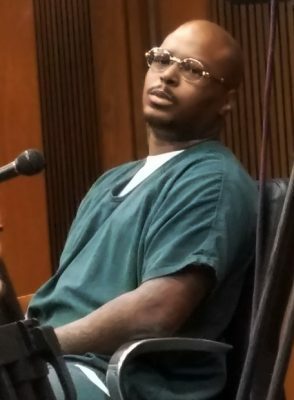 “I met Skinnyman in the URF [Chippewa Correctional Facility], and I let him know my rappee [co-defendant] did that situation he was in for,” Black testified. He told Searcy’s defense attorney Michael Dezsi that Smothers never said he had been threatened by anyone into testifying about the Segars murder. He added that he himself has no fear of Vincent Smothers. “He confessed, and he said his motive was to free the innocent,” Black said. Black identified two notarized statements dated in March 2017 that he had written to give to Searcy. See statement dated March 17, 2017 below. Black was composed on the stand, telling Assistant Prosecutor Thomas Chambers on cross exam that he did not feel Smothers had “ratted him out,” since he himself pled guilty in the Cobb case. Black’s testimony was preceded by Chambers’ introduction of three witnesses, Michigan State Police Trooper Christopher Corriveau, Detroit police evidence technician Patricia Little, and Segars’ widow Antoinette Segars. Corriveau was involved in the MSP investigation of Vincent Smothers for the four Runyon Street murders for which falsely accused Davontae Sanford spent 9 ½ years in prison. Corriveau said the Michigan Innocence Project also sent the MSP one of Vincent Smothers’ statements confessing to the murder of Jamal Segars. On cross-exam, he admitted to Deszi that neither the MSP nor Pros. Worthy ever re-investigated the Searcy case as a result of the statement. Smothers testified earlier that he recanted the one statement given to the MSP because he was told by unspecified parties that it would hold up the Sanford case. Michigan Innocence Project Director David Moran last year sent an unsolicited letter to Searcy telling him the Clinic could not represent him due to an unspecified “conflict of interest,” and refused comment on the case to VOD in a rather hostile manner. 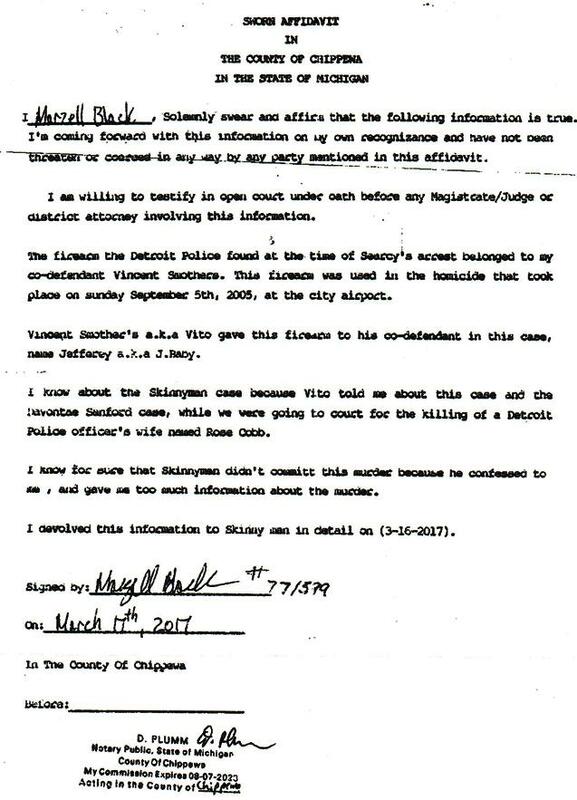 Smothers later gave numerous written statements and wrote letters to law enforcement and media officials including Wayne Co. Prosecutor Kym Worthy admitting to the Segars killing. Private investigator Scott Lewis also conducted a detailed taped interview with Smothers over the phone. He said also that the killing did not fit the pattern of Smothers’ hits, which involved lengthy preparation, and that he “had the impression” that Searcy was involved with a gang which threatened Smothers. But he admitted to Dezsi that Smothers’ statement said he had been tracking Segars for six months, and found his opportunity while Segars’ car was stuck in a bumper-to-bumper traffic jam during a street “Black Party” outside City Airport during the Labor Day weekend in 2004. Police later tried to say that Searcy killed Segars in a case of mistaken identity because he was driving a silver Corvette, as did DeAnthony Witcher, the jailhouse snitch police used in Searcy’s case. However, Searcy later found a DPD arrest report indicating Witcher drove a blue Corvette and was let off from a gun possession charge shortly before he implicated Searcy in the Segars killing. 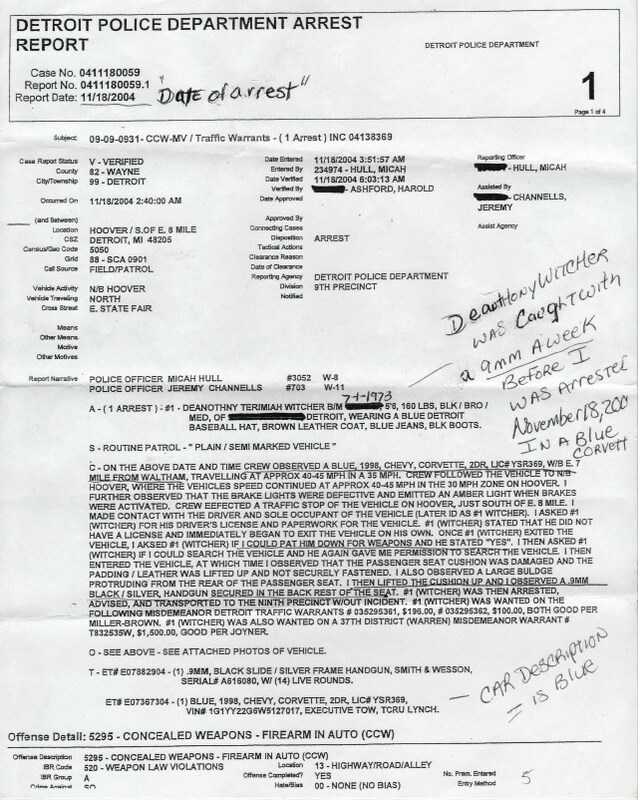 DPD arrest report on DeAnthony Witcher shows him driving a BLUE Corvette, not a silver Corvette. Defense attorney Dezsi objected to most of Corriveau’s testimony about the Smothers’ Segars statement as extremely vague hearsay, unsupported by any written documents, notes or tapes. But Judge Timothy Kenny overruled that motion as he did most of the defense motions. 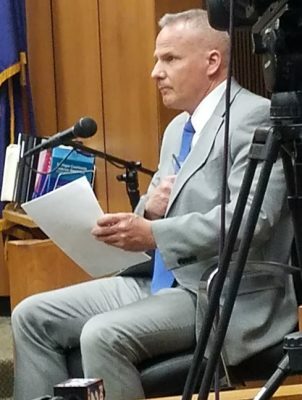 During testimony by Detroit Police evidence technician Patricia Little on forsensic ballistics evidence from the Segars killing, Kenny made the startlingly proud admission that he was involved in the case of Jarrhod Williams, which led to the shut shown of the Detroit Crime Lab in 2008. The MSP found 10 percent of forensic results had been falsified and 42 percent did not comply with scientific forensic standards. “I never thought the crime lab should have been shut down,” Kenny said during Little’s testimony. 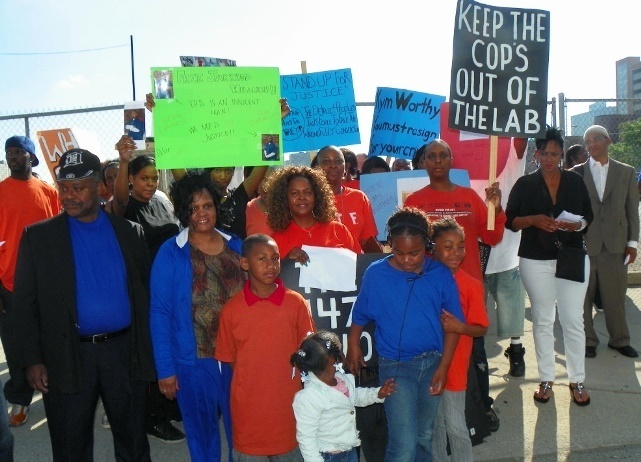 Crime Lab protest by families of wrongfully convicted prisoners June 11, 2017; Valerie Watts is at right in white pants. Williams’ defense attorney Marvin Barnett argued that the MSP had found that 42 spent shell casings at the scene of the crime involved came not from one gun, which they claimed belonged to Williams, but from two guns. Judge Timothy Kenny: crime lab should not have been shut down. 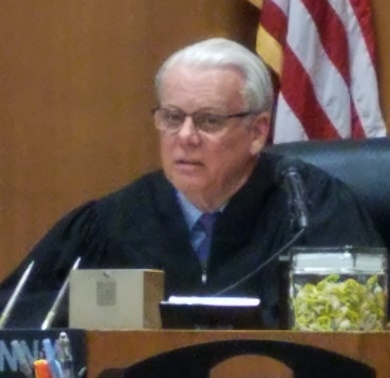 Williams first judge David Allen did not dismiss the case, but instead ordered a new trial over which Kenny presided. Williams was re-convicted in front of an all-white jury. This may present a conflict of interest for Kenny in the Searcy case, since some of it hinges on falsified ballistics evidence introduced by the prosecution and dramatically followed up on by defense attorney Deszi, with two large exhibits. 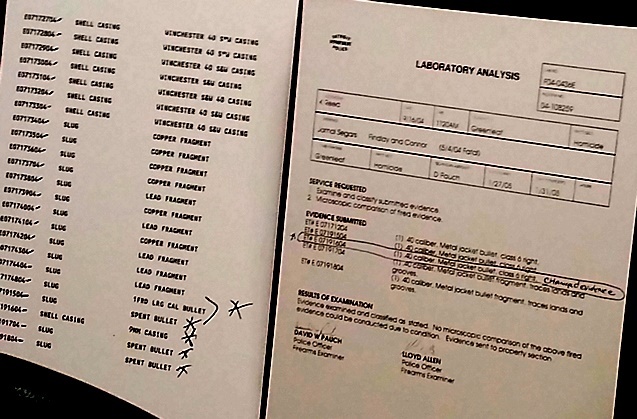 Exhibits showing falisifed ballistics reports. Chambers had Little testify regarding a sealed envelope from the Wayne County Medical Examiner’s Office, allegedly containing one of the slugs or pieces of slugs found either at the scene of the Segars’ murder, or in Segars’ head. The original evidence tag identified it as a 9 mm shell casing, while the tag number was later changed to identify it as a 40 mm casing. Searcy contends this means that forensic evidence in his case was deliberately falsified. 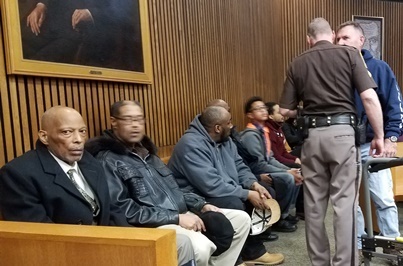 While Smothers and his associate Jeffery Daniels carried two guns that were consistent with most forensic findings, the discovery of a third gun, possibly carried by Detroit police who fired shots as Smother and Daniels, brings further doubt into his conviction. Judge Kenny ordered the MSP to take possession of the sealed envelope for another examination of the contents, and allowed Dezsi (who is court-appointed) to hire a forensics expert to oversee the examination. Family and associates of Jamal Segars in court; man at left grabbed this reporter by the wrist to drag her someplace private to talk to her about her stories on this case, but she refused. Later, she identified him on the court record, in case anything should happen to her. When she tried to talk to him afterwards with witnesses, he ran away.